Major mood disorders, which primarily include bipolar disorder and major depressive disorder, are the leading cause of disability worldwide and pose a major challenge in identifying robust risk genes. 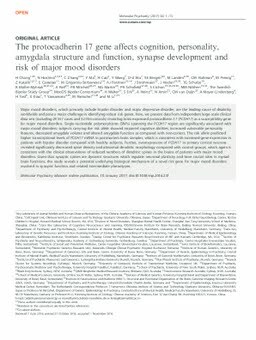 Here, we present data from independent large-scale clinical data sets (including 29 557 cases and 32 056 controls) revealing brain expressed protocadherin 17 (PCDH17) as a susceptibility gene for major mood disorders. Single-nucleotide polymorphisms (SNPs) spanning the PCDH17 region are significantly associated with major mood disorders; subjects carrying the risk allele showed impaired cognitive abilities, increased vulnerable personality features, decreased amygdala volume and altered amygdala function as compared with non-carriers. The risk allele predicted higher transcriptional levels of PCDH17 mRNA in postmortem brain samples, which is consistent with increased gene expression in patients with bipolar disorder compared with healthy subjects. Further, overexpression of PCDH17 in primary cortical neurons revealed significantly decreased spine density and abnormal dendritic morphology compared with control groups, which again is consistent with the clinical observations of reduced numbers of dendritic spines in the brains of patients with major mood disorders. Given that synaptic spines are dynamic structures which regulate neuronal plasticity and have crucial roles in myriad brain functions, this study reveals a potential underlying biological mechanism of a novel risk gene for major mood disorders involved in synaptic function and related intermediate phenotypes.